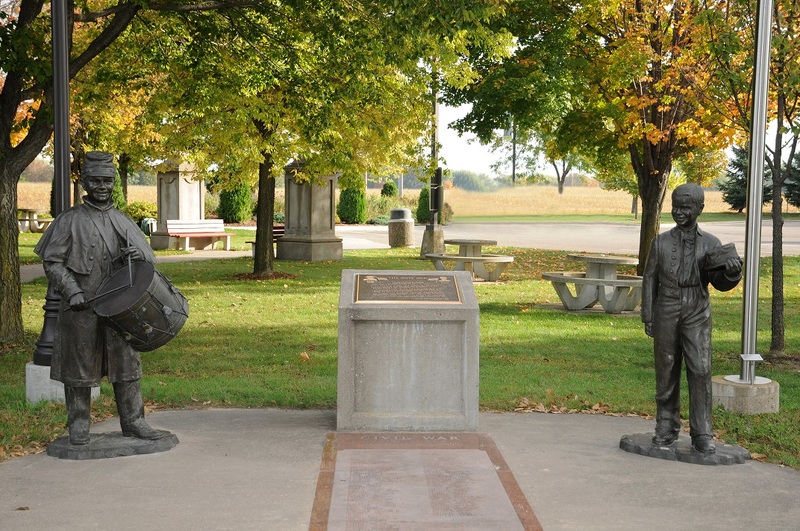 Across from the Abraham Lincoln & Civil war monument you'll see a monument dedicated to The Civil War Boys. Until well into the 19th century, western armies recruited young boys to act as drummers. Although there were usually official age limits, these were often ignored; the youngest boys, some as young as 9-12 years of age were not uncommon. Many were sometimes treated as mascots by the adult soldiers. The life of a drummer boy appeared rather glamorous and as a result, boys would sometimes run away from home to enlist. The drums were an important part of the battlefield communications system, with various drum rolls used to signal different commands from officers to troops. In the noise and confusion of battle, it was often impossible to hear the officers’ orders, so each order was given a series of drumbeats to represent it. Both soldiers and drummers had to learn which drum roll meant “meet here” and which meant “attack now” and which meant “retreat” and all the other commands of battlefield and camp. When war broke out in 1861, kids across the North and the South said goodbye to their fathers, brothers, uncles, and cousins -- or joined the military themselves. As many as 20% of Civil War soldiers were younger than 18. Children were an active, enthusiastic, and critical part of Civil War society. They comprised a much bigger portion of the US population in 1860 than in the 21st century, with persons under age 19 making up nearly half of the population (compared to less than 25% today). 18 was the minimum recruiting age for Union soldiers, but many people willingly overlooked the law. The Confederacy set no minimum age. Many young soldiers enlisted as musicians -- drummers, fifers, or buglers. In theory, musicians didn't fight. But once a battle began, these kids often armed themselves -- to save their own lives or the lives of their friends.